Brigham Young University–Idaho (BYU–Idaho or BYU–I) is a private university in Rexburg, Idaho. It was founded in 1888. The university is owned and operated by The Church of Jesus Christ of Latter-day Saints (LDS Church). BYU-Idaho changed from a junior college to a four-year university in 2001. 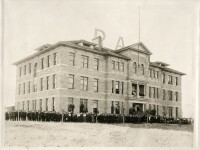 For most of its history it was known as Ricks College. BYU-Idaho offers programs in liberal arts including the sciences, engineering, agriculture, management, and performing arts. The university is organized into six colleges. Its parent organization, the Church Educational System (CES), sponsors sister schools in Utah and Hawaii. The university's focus is on undergraduate education. It offers 18 associate and over 70 bachelor's degree programs. BYU-Idaho operates using a three-semester system also known as "tracks". Students at BYU-Idaho are required to follow an honor code. About 99 percent of the university's students are members of the LDS Church. A significant percentage of the student body take an 18- (women) or 24-month (men) break from their studies to serve as missionaries. A BYU-Idaho education is generally less expensive than similar private universities. This is due to a significant help by LDS Church tithing funds, helping keep tuition rates low. Brigham Young University–Idaho Facts for Kids. Kiddle Encyclopedia.